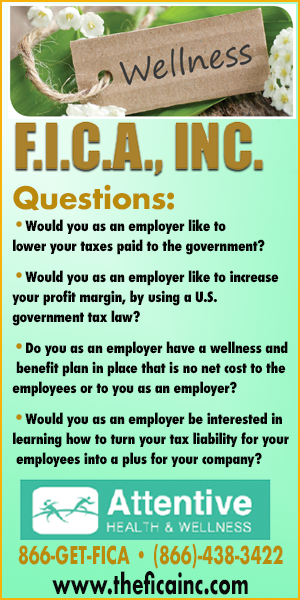 FICA Inc. helps companies maximize their FICA tax dollars to create qualified wellness programs. Less than a year ago a team of industry professionals led by Wiley Day and Dr. Charles Kennedy got together to discuss how best to help our communities and businesses in light of the new realities post Barack Obama. Focusing on the health of our communities and how to best increase access to quality healthcare Financial Institutional Change Agency Inc. (FICA Inc.) was formed. Over a 44-year career, Wiley Day has developed a specialized skill set entailing Marketing Management, Product Development, Strategic Management Planning, Program /Project Management, Government Contracting , Contract Management and the development and implementation of long range Master Plans utilizing sophisticated market analysis techniques and feasibility studies based on market trending and forecasting. He has dynamic Sales and Marketing experience in diversified industries in both the public and private sectors; including Manufacturing, Distribution, Wholesale, Retail, Construction, Government, Education, Media and Finance. Mr. Day served as Production Control System Analyst for a major American global information technology company that provides a portfolio of IT services, software, and technology. His management of Bill of Material Processing, Material Requirement Planning, Work Center and Routing, Job Costing and Scheduling, and Work in Process included the design and implementation of a computerized “Order Entry” System to monitor Customer orders while tracking inventory availability that eventually lead to the implementation of a “Just – In -Time” (JIT) manufacturing process that significantly reduced inventory levels resulting in significant reductions in material cost and handling while maintaining timely delivery and a quality operation. Wiley Day with his background as a Government Contact Specialist and Negotiator for the Federal Government has knowledge of contract methodologies and the contract administration for projects in excess of $200 million. Mr. Day’s current focus is primarily set on implementing methodologies and developing strategic alliances with global business partners to create effective, business models for corporations in all industry sectors that generate significant savings in various categories: payroll, FICA tax reduction to implement Wellness Programs, Telemedicine, Supplemental Insurance Benefits, Cost Segregation, Procurement Cost Reduction and generating new revenue streams. Charles Kennedy has served as the Founder and President of several non-profit and for- profit companies. As a young man, Kennedy signed a professional baseball contract with the Minnesota Twins Baseball Organization. He also was a professional musician for the duo of Sam and Dave and managed the recording group Faith, Hope and Charity. He launched Keys To Life Mission with the purpose of helping poor and disadvantage adults and students as both an employer and advocate to help them pursue their educational goals. Charles Kennedy was one of the first African-American ministers to host a national television program on Christian Television. In 2004, Mr. Kennedy founded and incorporated the non-profit, asset-based trust, Our Trust, in the State of Florida. Working primarily in real estate, the trust’s assets grew to over $100,000,000. Charles Kennedy founded the non-profit African/ American Business Foundation (AABF) to develop businesses and projects that will enhance the African/American business and academic communities; encouraging them to begin and sustain their goals and objectives. Presently, Kennedy has a partnership with a non-profit organization in Liberia, West Africa through AABF. AABF and its partner in Liberia have agreements throughout the 15 counties of Liberia to assist the indigenous people in developing their land and resources to lift them out of poverty. The officials of the Liberian government have been assisting in this effort. Both the Muslim and Christian communities are working together as one to realize their hope of using their natural resources to better their lives. Kennedy was ordained as an elder in the Church of God in Christ in 1976 and has served as the founder /pastor of the Glorious Church in Tampa, FL. since 1980. With this dynamic duo at the head FICA Inc. headquartered in Huntsville Alabama quickly identified that small and mid sized companies don’t take advantage of IRS rules and programs centered around wellness programs for their employees. Astoundingly FICA Inc and its team of IRS and insurance experts recognized that many businesses qualify to use a portion of their existing FICA employee tax deductions toward these programs. Depending on company size they found it is possible to save 500-700 dollars per employee per year and apply that toward employee health benefits. On the surface that sounds like something every business should know and want to implement. 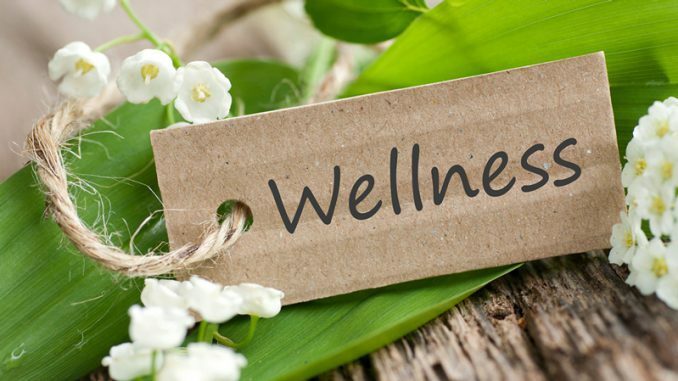 However navigating government rules and regulations particularly around wellness are an overwhelming task even for large corporations let alone small to mid size businesses. With their mission set Financial Institutional Change Agency, Inc. is ready to facilitate the economic vitality of communities by the implementation of strategic business systems designed to educate, reduce debt, increase profits, accelerate wealth accumulation, and stabilize employees’ lives through broad benefits, retention incentives, asset protection and retirement strategies. Whether you are a small business or big business, servicing your customer base and making a profit are primary objectives for doing business. Financial Institutional Change Agency, Inc. (F.I.C.A., Inc.), along with our global partners, has the experience, connections, and supplier network to lower your costs on virtually any product or service your company is currently buying! Our global team of tenured, cost-reduction experts and partners create innovative cost reduction strategies, services, and tactics to strengthen corporate financial performance while increasing your profitability. This can be accomplished without an increase in sales and without layoffs. Over the years, we have been able to reduce our clients’ spending on an average of 30%. We provide a written guarantee of our performance! There is no out-of-pocket cost to your company because we participate only in the savings. 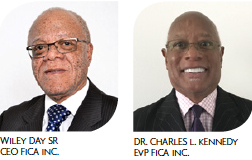 FICA Inc lead by CEO Wiley Day, EVP Dr. Charles Kennedy, COO Reginald St Clare, IRS expert Dr. Bob Bedford and a corporate team of insurance, IRS, healthcare, community and marketing professionals is set to make a difference. Charged with the mission of assisting Companies, CEO’s, municipalities, human resource and finance departments on how to restructure so they could qualify to create wellness programs at no cost the FICA team implemented its first program in the City of Fairfield Alabama. CEO Wiley day in a recent interview stated “Your company will greatly benefit by reducing your FICA annual payroll taxes by $500 to $700 per employee. Your employees will recognize an average of $150 per month in savings to be used in purchasing additional insurance benefits. Which means these programs are cost neutral, if the company can qualify”. With a short 20-30 minute survey we can determine if we can create a program for your company. Even a company with as few as 5 employees can qualify with our help. Day went on to say that all parties- the company, employees, and FICA Inc share in the saving created by the programs that is the beauty of what we are doing everybody wins. 3 FICA Inc. Helps the community it serves and generates a modest profit to continue its mission. Taking the program national and expanding its team of agents to cover the country FICA Inc and its partners Above The Standard, and others are set to make a difference on the health of the American landscape. Financial Institutional Change Agency Inc.